Anyways, am leaving for Bangkok in less than 24 hours and I'm stoked!!! From the way I sound, I think you can tell that I'm a newbie/first-timer. Hahahah. Seems like almost everybody around me has been to BKK! Some of them even go there every quarter of the year, and I can't wait to find out why it is so addictive myself. I'm very positive that I'll love BKK because there's really nothing to dislike about shopping, food, night life and massages right? The best part is that I'll be going with a bunch of really, really close friends whom I feel absolutely comfortable with. From my experience, it really can be a kill joy if you travel with people who are fussy and want things to only go their way. No matter how beautiful the place is, as long as you're not with the right company, you wouldn't be able to fully enjoy because they'll just make life difficult for everybody. How this trip came into place was pretty random too. Was yumcha-ing with my wedding photographer Vincent, wedding coordinator Li-hsia and Pat the Elephant and the husby one fine night at Brussels in November last year. That midnight itself was AirAsia's cheap tickets promo. While at that, we jokingly started to plan trips to BKK, Taiwan, London, Japan, etc etc which gave the guys quite a heart attack especially when we just returned from our honeymoon in Bali at the time hehe. Waited for a good 3 months plus for this trip. Busy with our daily lives and tadddaaaa, we're going tomorrow before dawn! The girls are very determined to make this trip worthwhile and fruitful, so we're making sure than we plan well so that we wouldn't waste any time wandering around/getting lost in BKK. Been doing lots of research by reading reviews, blogs, and asking friends on my social media platforms. Before I go, here's another update! I CHOPPED OFF MY HAIR AGAIN! It's been 3 months since my last haircut on the first day of the year. Though I really liked the length and all, I felt it lacked shape and style. 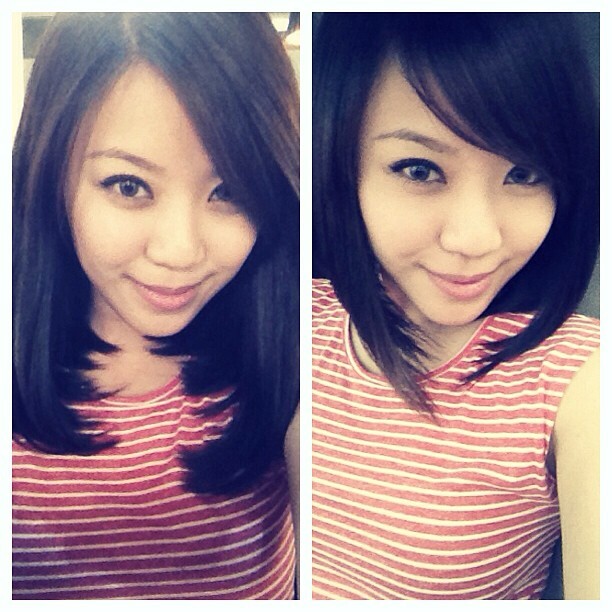 So decided to get a bob haircut that I've always wanted to try, and went to my trusted hair saloon, Cut! Studio for a haircut. So far only one picture of my new hair as I've been busy sticking tissues into my nostrils. Haven't been fit for picture so yeah, no pictures of my new hair. Hoping to fully recover before my BKK trip tomorrow.